The craving for healthy living continues to grow. From salmon bites to coconut chips, here’s the latest distribution news in the natural food world. 1908 Brands, a parent company of five natural CPG brands, has experienced significant gains in their distribution channels as of late. Three Bears and Thrive Tribe will be on the shelves of over 2,000 CVS stores beginning in May. 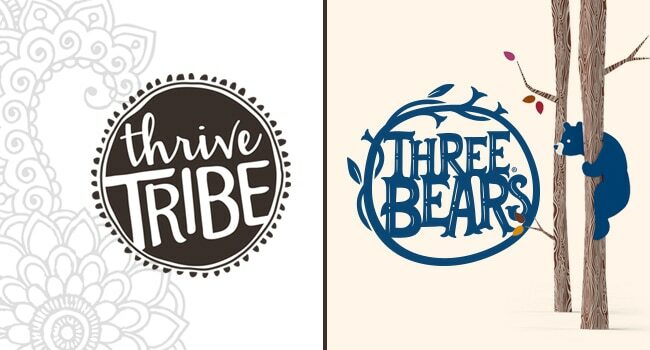 Three Bears offers gluten-free, oat-based snacks such as bars, cups and purees, while Thrive Tribe offers paleo-friendly snacks including bites, bars, coconut chips and cookies. Thrive Tribe products will also now be available at all Costco locations in Colorado and in select stores across the Northeast and San Francisco. Another 1908 brand, Schultz’s Gourmet hot sauces will launch three SKUs — spicy original, sweet heat and green chili lime — in more than 1,800 Walmart stores nationwide. These retail wins follow a major growth spurt for 1908, which acquired three companies, launched one brand from scratch, and licensed the name of another in 2017. 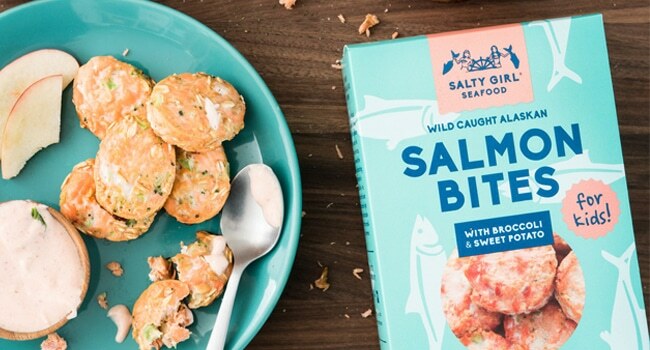 After participating in Target’s Takeoff 2017 accelerator cohort, Salty Girl launched their Salmon Bites line into over 250 Targets across the country last month. “We are grateful for our Target Takeoff experience and are excited to expand our mission and grow our line into stores nationwide,” Norah Eddy, co-founder of Salty Girl Seafood, said in a statement. The frozen salmon bites are available in two flavors — lemon and sea salt and black beans and corn — and contain no dairy, gluten or added sugars. Eddy explained that she created the product to offer better seafood options that appeal to children. Ready-to-drink and whole bean coffee company La Colombe has become one of the first food and beverage brands to take a bold stance on gun safety. 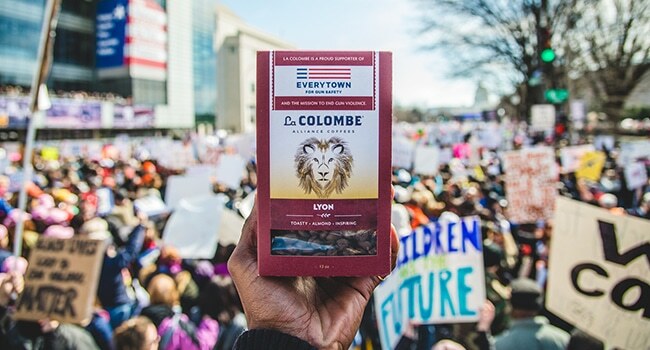 In support of the mission to end gun violence, La Colombe is donating $7 from each sale of its Lyon blend to the nonprofit Everytown for Gun Safety. The blend, described as “gentile nature[d] both in flavor and spirit,” is available at Whole Foods Markets throughout the Mid-Atlantic region and on La Colombe’s website. The campaign will run through the end of April. Starting in May, Neilly’s Rice will distribute six SKU’s to over 1,500 Kroger locations across the country. Kroger is the latest addition to Neilly’s distribution portfolio, joining the likes of Whole Foods and Walmart. Founded in 2012, Neilly’s Food offers beans and rice mixes along with a line of frozen meals and appetizers. To better appeal to today’s consumers, the brand embraces global flavors from Africa, the Caribbean and Latin America. Pork rind maker Southern Recipe Small Batch continues to expand its distribution with its recent deal with Cost Plus World Markets. The store will carry four of Southern Recipe Small Batch pork rinds: sea salt and cracked black pepper, Korean kimchi BBQ, pineapple ancho chile and spicy dill. The Dallas-based brand is not only growing its retail presence, but also its product portfolio. Last month, the company launched a new line of oven baked pork rinds, available in cilantro lime, blackberry habanero and smoked sea salt flavors, as well as released honey chipotle pork cracklins. Brooklyn-based RifRaf is bringing its ricotta cheese cups to select Whole Foods Markets across the tri-state area. Whole Foods is the first major retailer for RifRaf, which launched earlier this year. The cups come in five flavors — serrano pepper honey, wildflower honey, sun-dried tomato, strawberry balsamic and meyer lemon — and combine ricotta cheese with jams and honey. Compared to yogurt, the cheese cup space is relatively untapped outside of cottage cheese. The market does present significant challenges, however, as many consumers associate cheese cups with dieting rather than indulgence. The New Primal Adds Walmart: Jerky-maker The New Primal added their most recent innovation, a gluten and dairy free marinade line, to over 650 Walmart stores nationwide last March. While the marinades still have limited distribution, the company’s jerky brand can be found across retailers including Whole Foods, Target and Safeway. Parker’s Real Maple to Sprouts: New York-based Parker’s Real Maple debuted its traditional thick and rich maple syrup at Sprouts locations nationwide last March. Sprouts joins the ranks with retailers like Whole Foods, Wegmans and Costco. Along with syrup, Parker’s Real Maple offers products ranging from cotton candy to maple butter. DNX Foods Enters Sprouts: DNX grass-fed beef and bison bars are now available in all Sprouts locations nationwide. This partnership more than doubles the distribution of DNX’s sweet potato pecan, Mexican style and Jamaican style bars. Ayoba-Yo Expands into Two Retailers: Ayoba-Yo added its South African beef snacks to Kings Food Market and Balducci’s Food Lover’s Market. Ayoba-Yo is now available in over 100 stores. The company said it expects to expand its distribution in the Mid-Atlantic and Northeast by the end of this year. Bubbies Partners with Kroger: Hawaiian-based Bubbies Homemade Ice Cream and Desserts Inc. launched their Mochi ice cream in over 850 Kroger stores across the Midwest and Eastern United States, the company announced last month. The ice cream, which contains 100 or less calories per serving, is also available at select Whole Foods Market and Safeway locations. Peatos to Launch at Kroger: Snack it Forward’s brand Peatos will be available at Kroger stores across the country this May. Peatos, a plant-based snack made from dry beans, peas, chickpeas and lentils, is available in four flavors: classic cheese, fiery hot, chili cheese and masala. Peatos is currently on the shelves of Pavilions, Vons, Albertsons and Amazon. NadaMoo! Expands Southern California Footprint: Dairy-free frozen-dessert maker NadaMoo! launched their full coconut-based “ice cream” line at Stater Brothers Markets earlier this month. The brand was also recently added in Hy-Vee locations across the Midwest. This distribution news comes on the heels of NadaMoo!’s $4 million raise at the end of 2017.